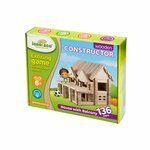 Are you looking for an interactive and safe constructor set for your child? Well, you came to the right place! 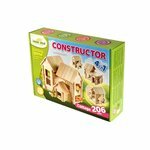 We have classic wooden construction sets, unique Japanese programmable sets, and STEM construction sets with electric motors. 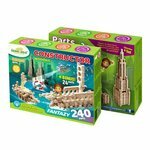 All construction sets are designed to develop a variety of skills: logical and creative thinking, to teach programming, electronics, engineering. 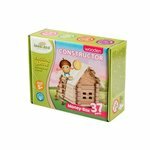 Multifunctional wooden construction set to assemble a comfortable home for your favorite toy. It can be transformed into plane, truck, or anything you can imagine. Made in Ukraine. 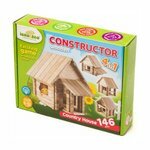 This construction kit is designed for building four different cottages with original planning and amazing architecture. This is more than just a toy, the wide range of elements will help you to become a real architect. Made in Ukraine. This construction kit allows you to build 4 small cozy houses with doors and windows. With the wide range of elements in this set you can build a whole street or even a cottage village. The village can be decorated with flowers and landscape elements out of materials at hand. Made in Ukraine. 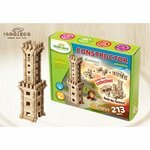 This universal construction kit consists of 240 wooden elements and gives you made endless possibilities to construct anyhthing you wish. Different sets can be combined with each other to get new somplex shapes. Made in Ukraine. Building set that allows creating one’s own hut! Small in size, this hut is perfect for role-playing games. Different sets can be combined with each other for building a station, a farm or even a whole village with different types of buildings. Made in Ukraine. Create a real money box in a form of a hut for your pocket money. When it is full with coins, just disassemble and stack it back together again. If desired, the parts can be glued together with PVA glue and painted to one’s own liking. Made in Ukraine. 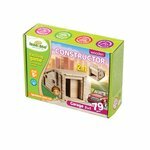 This construction kit allows creating 2 wooden garage models - large and small, that will be a wonderful addition to games with cars and make it possible to build your own city with a car fleet. Made in Ukraine. 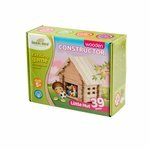 Universal construction kit made from natural wood opens fantastic possibilities to create anything with no restraints of your imagination. Different sets can be combined with each other to get endless opportunities for creation. Made in Ukraine. 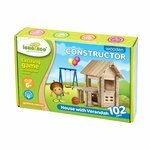 This construction set allows you to build a house with two tiers and a verandah. You can easily take the ready-made model anywhere and even make it a home for your favorite toy. Made in Ukraine. This construction set is designed for individual assembly of tower, that can be transformed into Viking or train. Tower is the first product of a new "Fortress" series. Made in Ukraine.